The iPhone 7 Plus dominated benchmarking charts but it looks like it has finally met its match as the HTC U11 manages to breeze past the 5.5-inch phablet for the month of May. These scores can definitely change in the near future, but for now, it is the HTC U11 that reigns supreme on the leaderboards. 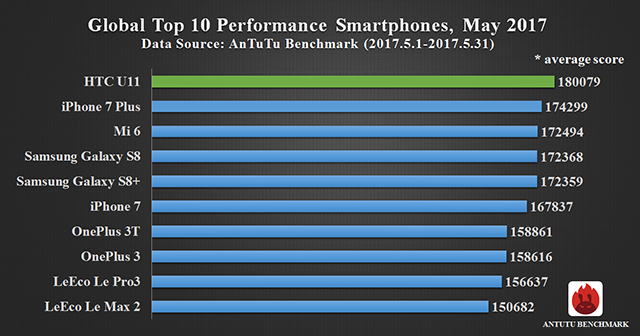 Though users might be reporting different results for every smartphone they see on the list, the recorded results show that the HTC U11 has obtained a score of 180,079, thus taking the number one position in the AnTuTu benchmarking results. The iPhone 7 Plus’ dominance has been thwarted by the Taiwanese’s flagship smartphone, but the results could immediately change when the scores are updated. The Xiaomi Mi6 and Galaxy S8 fail to climb the rankings against the iPhone 7 Plus and we feel that the less resource-hungry UI of the HTC U11 might be a contributing factor to this. As several reviewers have claimed that HTC’s newest member to the flagship smartphone category feels much snappier and can also be crowned the comeback king after the manufacturer released what is regarded to be a poorly priced and spec’d handset, the U Ultra. 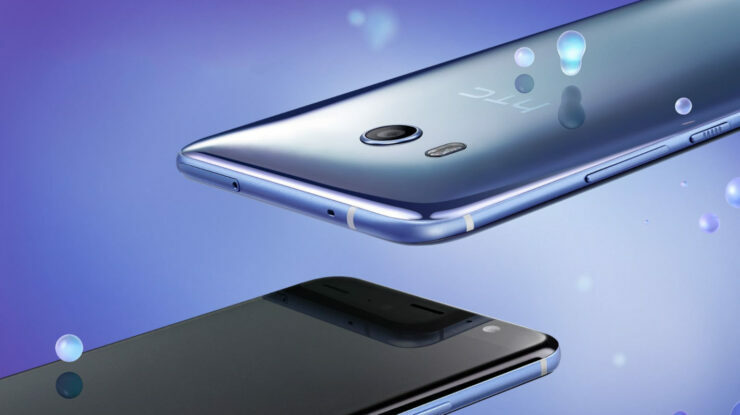 The HTC U11 also manages to elevate the performance of the Snapdragon 835 by featuring 4GB of RAM as well as UFS 2.1 storage. We also feel that the read and write speed results of the internal memory is a huge contributing factor to the overall performance as that is what makes or breaks the fluid experience of a mobile device. Do you feel that the scores could be any different in the later months of 2017? Tell us your thoughts down in the comments.